Thursday, 9/27: Have you considered a Career in Animal Agriculture? Why not! Career Opportunities are still great in the animal agriculture industry, government and allied animal agriculture industries? Learn how you could be part of this exciting field.U.S. 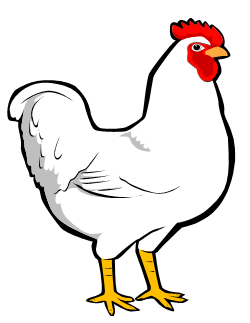 Poultry & Egg Association: Barbara Jenkins, Vice President, Education & Student Programs will present an overview of the Industry and the many poultry career opportunities. Next, Dr. Karen Lopez, Deputy State Veterinarian at the Delaware Department of Agriculture will discuss the DDA’s commitment to sustain and promote the viability of food, fiber, and agricultural industries in Delaware and how you can join their effort. Learn how you can attend the 2018 College Student Career Program in Atlanta, GA.
Wednesday, 10/3 Use Internships and Management Training Programs to Jump Start Your Resume and Start Your Career. Speak directly to employers who are offering internships, management trainee programs and full time positions. Pat Townsend, Director of Human Resources at Mountaire Farms (6th largest poultry company in the US) will talk about Mountaire’s large number internships and their career training program. Dr. Milos Markis is the Laboratory Manager at AviServe, LLC, a local poultry research laboratory and consulting service will discuss internship opportunities. 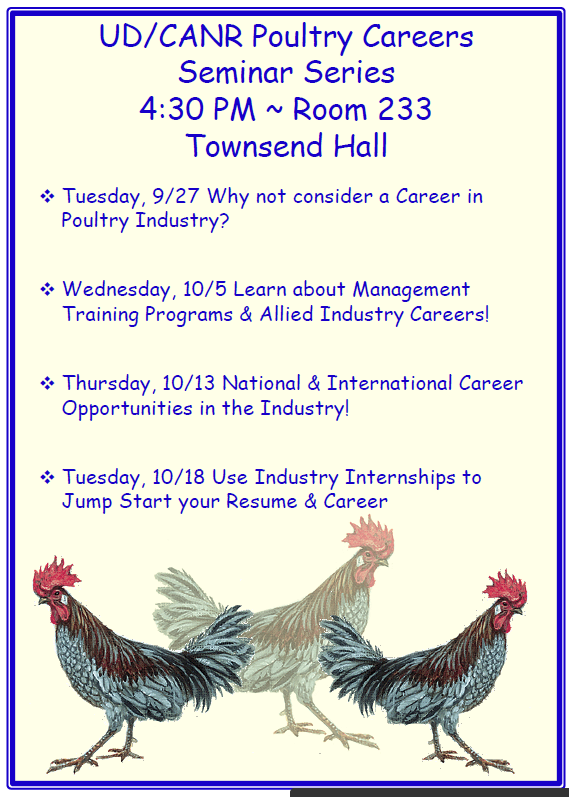 Tuesday, 10/16 Learn about Local and Regional Career Opportunities in the Animal Agriculture & Allied Industry. Wednesday, 10/24 National & International Opportunities-Have you ever considered a career with an international company or with a national organization? Find out more about these exciting possibilities! Cobb-Vantress is one of the world’s leaders in research, development and sellers of breeding stock to the broiler industry. Todd Baker, Pedigree Complex Manager will discuss internship and full time positions at Cobb. Dan Sverson, New Castle County Extension Agent II will explain about internships and how UD Cooperative Extension connects the agricultural community and public with university knowledge and research as well as programs like 4-H.
Also learn about the opportunity to travel to Atlanta, GA in February 2019 to attend the USPEA College Student Career Program with opportunities to interview with 35 regional, national and international poultry and agribusiness companies and organizations while having the opportunity to network with over 1350 companies at the largest international poultry and agribusiness trade show. Most student travel expenses are covered with minimal cost to students attending this conference. Aviserve – a local company owned and operated by former UD faculty is currently seeking 2 to 3 undergraduate students or very recent graduates that may be seeking part-time employment during the academic year which can extend into the summer months. Preference is for junior or senior students majoring in Pre-Veterinary Medicine and Animal Biosciences. Our main focus is directed at the recognition and control of economically important infectious diseases that affect the chicken and turkey industries. Students who qualify will be well compensated and given significant hands-on experience in both in vitro and in vivo applications of infectious disease research in both laboratory and commercial production environments.